Your force is a flying column of Imperial Japanese troops under the command of General Sushi Miyagi. Your mission is to cross into the Gobi Desert as a reconnaissance force, with the aim of linking up with a Japanese agent, Captain Kagemusha, who has been operating in disguise on an intelligence gathering mission in Outer Mongolia. As such, the mission is highly sensitive and clandestine, although you have successfully evaded detection thus far due to the small size of your convoy and the clever use of camouflage, night movement and counter intelligence, not to mention bribing the various tribal leaders along the way with gifts. You suspect, however, that your presence may soon stir up a hornet’s nest. Your force is sufficient to ensure that it can easily deal with any potential threat, having an armoured car, heavy machine guns, a battery of artillery and an attached reconnaissance aircraft. Your troops are also of high morale and very well trained, so more than a match for any potential opposition that you might encounter. You also have a considerable asset in the form of Captain Kagemusha who has been sent ahead on a secret mission to Urga. Captain Kagemusha is an expert in the customs of the region and speaks numerous local dialects. He has travelled extensively in China and Mongolia and has many useful contacts and a detailed knowledge of the lie of the land. 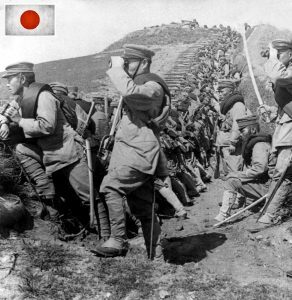 (Gary’s Japanese army is a well balanced and powerful force. His troops are tough and have high morale. This army is definitely one to watch and stands a very good chance. The figures are from the Copplestone Chinese range with a simple paint conversion).